Images for Trumpet is a three movement work for solo trumpet, winds and percussion. It was composed in March of 2004 for trumpeter Terry Everson. The composition is in three movements - Signals, Reflections and Celebration - each emphasizing the different colors of the solo trumpet and ensemble. The solo part requires a Bb trumpet, a flugelhorn and a Bb piccolo trumpet. 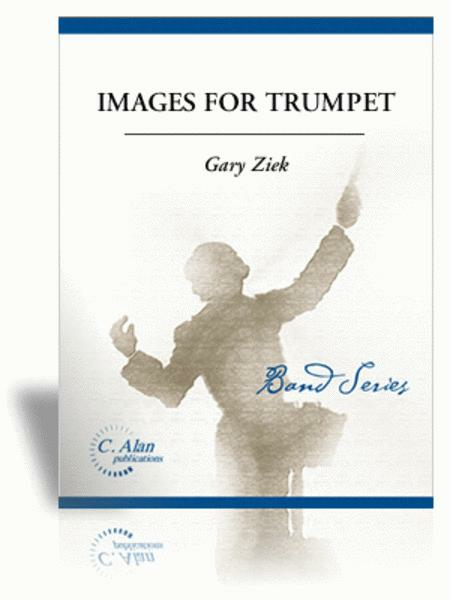 Images for Trumpet is a three movement work for solo trumpet, winds and percussion. It was composed in March of 2004 for trumpeter Terry Everson. The composition is in three movements, each emphasizing the different colors of the solo trumpet and ensemble. The first movement, Signals, harkens back to the trumpet's origin as a signaling instrument. Trumpeters were stationed in towers in their cities, and would play signals and fanfares to herald certain events. The movement starts with a series of short fanfares, accompanied by a terse background in the ensemble. The movement gathers speed and intensity in route to the main theme of the A Section, which is based around a seven note repeated pattern in the solo part. The B section begins with a lyrical, soaring statement by the trumpet. A series of exchanges between soloist and ensemble leads back to the recapitulation, which is followed by a cadenza and driving coda. Reflections is dramatically different in style. The flugelhorn and muted trumpet help to establish a moody, dark atmosphere. This movement is built around a marimba ostinato, with layers of sound coming from the rest of the ensemble. The percussion section plays in a style influenced by African timbres and rhythms. Celebration features the Bb piccolo trumpet as the solo instrument. This movement is a five part rondo (ABACA), and is lively and full of energy.